Time for the Ways to Use It Challenge over at Splitcoast Stampers…using some form of emboss resist. A very simple and easy to duplicate card today. The background was stamped with the script stamp in Hero Arts Soft Granite. Next it was heat set…this is very important! Then the Technique Tuesday Evergreen trees were stamped in Versamark and clear embossed. 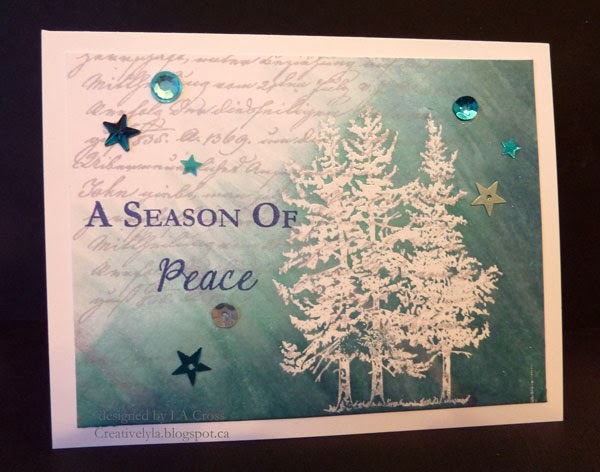 Then I inked the right side of the card with Evergreen Bough, Peacock Feathers, Pine Needles and Chipped Sapphire Distress inks. Once that was done, I used a water brush to pull the colors over to the left upper corner somewhat. Finally, the sentiment was stamped in the Chipped Sapphire, added a few sequins/rhinestones and done! Back soon with more and GO RIDERS!!! Beautiful card, Lee-Anne. Gorgeous scene with the pretty trees and your wonderful technique. Stunning Christmas card Lee-Anne! Love added stars and bling! Guess who is much more pretty than she is smart???? I don't know, either. Howevah…when you stamp the background and 'heat set', what do you mean? I'm down with clear embossing, resisting and other 'palabras de un poco sucio', but this one eludes me. Splain', please!!! TYTYTYTY!! Lovely card. The stars were the perfect finishing touch. Next Next post: Black Snow?